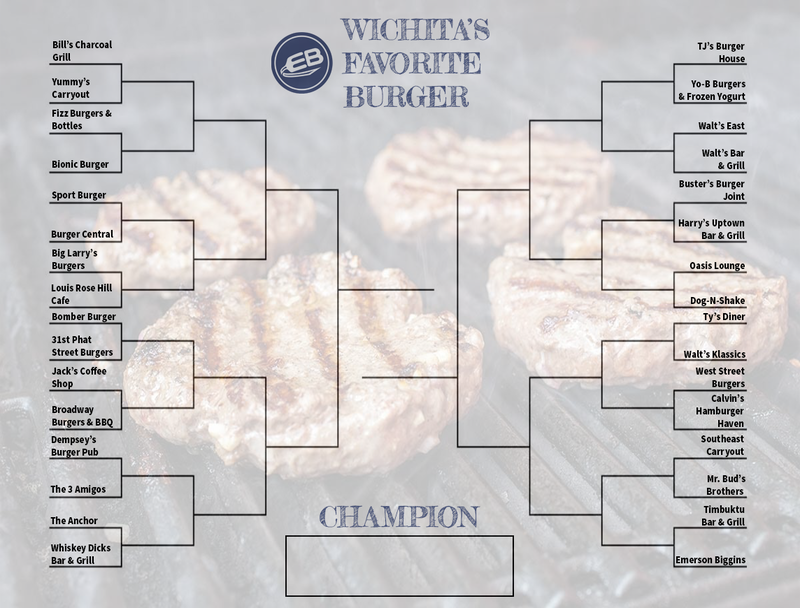 Time to decide who is Wichita’s Favorite Burger – Wichita By E.B. Years ago, I went to thirty different restaurants and bars around town to decide which burger I felt was best. It spurned a lot of chatter and let’s face it, “food lists” are always fun. Anytime there is a debate of who is best, it always draws a lot of opinions. For my next little “project”, I wanted to put the debate into your hands. Over the course of a handful of weeks, I’m interested to see who everybody thinks is Wichita’s Favorite Burger. With your help, I compiled a list of places not just limited to Wichita. You’ll find popular stops in such places like Andover, Rose Hill, and Valley Center. After some debate, I kept this list to brick & mortar restaurants so some trucks suggested like The Flying Stove and the recently opened Uno Mas Burger were not in the final list. Perhaps a “Wichita’s Favorite Food Truck” could be next? Restaurants like NuWay were also omitted as I kept this to traditional burgers. Local Wichita chains that have a national footprint like Freddy’s were also kept out. From there a list was narrowed down to 32 and then seeded based on Facebook traffic, Yelp reviews and general popularity into four different regions. Finally, I titled this Wichita’s Favorite Burger because ultimately that is what this is. By no means does this voting mean, “Best”. Starting Friday, you will find a poll featuring one restaurant matchup on the Wichita By E.B. Facebook page to vote for your favorite. Voting starts Friday, may the best burger win.